⬅ What does success look like, really? How do you make a difficult decision? The best way to make a major life decision is to go with your gut. Nobody likes to hear that because it just seems so unscientific. Correction, I actually think that plenty of people like to hear that. However, far fewer people like to say that. In his book, Start With Why, Simon Sinek does a fantastic job explaining that the limbic brain is the portion of the brain that supplies those “gut” feelings. Unfortunately, the limbic brain does not also control language. That’s the neocortex. This separation is the reason that often we just know the right decision in our “gut”, but we can’t seem to explain why it’s the right decision. Our limbic brain knows what to do, but our neocortex has a hard time explaining it. So while we might feel our emotions in our gut – I know I do – those gut feelings originate in our limbic brain. It’s important to note, then, that there is a real, even scientific, intelligence to those gut feelings. So if your gut is indeed a good place to go for decision-making wisdom, how do we get in touch with our gut? Is there a process for identifying what our gut is telling us? There’s a framework that I’ve been using with my clients that will supply you with the data that you need to make a good gut decision. Note though that the data you’ll receive will be descriptive not prescriptive. Meaning that the data doesn’t make the decision right, it flows out (or is a result) of the right decision. The process then is about merely uncovering what you already know to be true in your gut. I first encountered this framework at Coaches Training Institute and have since adapted it a bit. Each slice of the pie in the image above is a perspective from which you can view the topic at hand. Essentially, you are going to try on the decision from several different perspectives. It doesn’t have to be eight different perspectives, but shoot for at least three – ideally, five or more. You’ll then make your decision from the perspective that most resonates with you. That’s your resonant perspective. Choose the perspective that most resonates with you. Take action on your decision from that perspective. Ok. So you’re ready to get in touch with your gut and try on various perspectives. Current Perspective: Torn about making such a “radical” change. I can’t decide. Barcelona Perspective: Quit my job tomorrow and get ready to move to Barcelona. Stay-Here perspective: Stay at my job and never travel to Barcelona, even for vacation. In-Between Perspective: Go part-time at my job and and use the extra free time to do some extended travel in Barcelona. 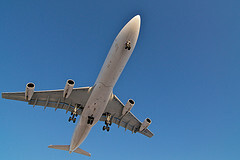 Methodical Perspective: Research and apply for Travel Visa. After approval, discuss with my friends, talk to my boss, then make decision. Off-the-wall perspective: What would my dog advise me to do in this situation? As you identify perspectives, list them out. Don’t be afraid to be creative or off-the-wall with a few of your perspectives. Remember, you’re not solving a math equation, you’re looking for resonance, or a “gut reaction”. Stand absolutely in that perspective. When you are in a given perspective, suspend disbelief and try on the conviction that the given perspective is absolutely the way things are. Describe how you feel in that perspective. Do you feel alive? Anxious? At peace? Also, use physical descriptions, like warm or cold or tingly. Find the value in that perspective. Every perspective has some value in it, even perspectives that we’d like to move away from. Name at least one valuable thing from each perspective, even if you despise the given perspective. If you have a stated life purpose, determine how that decision feels in light of your purpose. How does this decision align with your purpose? Does it support it? Does it detract from it? Determine which perspective resonates most with you. 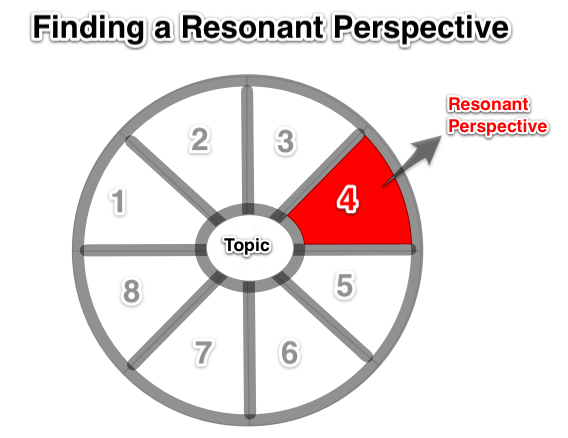 After having stood in each perspective, choose your resonant perspective, or the perspective that feels best in your gut. Take action from that chosen perspective. Now that you’re in touch with your gut, decide to take some form of concrete action from that place. It could be: quit my job tomorrow. Or it could be: research other people’s experiences moving to Barcelona. During the course of this exercise, you may find that the “decision” that you were agonizing over was NOT the real issue after all. For instance, you may realize that you’ve been daydreaming about moving to Barcelona, but the real issue at hand is a lack of adventure in your life. The remedy might be moving to Barcelona. Or maybe it’s something else. And that’s ok – as long as you have the courage to take concrete action to honor that gut feeling. The point is not to get the decision “right”, as if there is a scripted set of circumstances that are predetermined for you to live out. Instead, the point is to honor your gut and take one more step towards a life that is deeply fulfilling for you and of great service to others. Do you think gut-based decisions are the way to go? What do you think about the practice of trying on different perspectives? Excellent article. Thanks for sharing this technique! No problem, Karen. Glad you enjoyed it! Gut is totally the way to go. For me, it is also helpful to think through the perspectives and options — and build confidence with a pro and cons list while noting the times that resonate the most. Leading me back again to gut. Ultimately decisions are not just about gut but also about fear, confidence and courage. Wow. Love the pros and cons list leading you back to gut. Great. Thank you. I am in the middle of a big decision about career, and this is very timely and helpful. I think the perspective process is a good one. It gives credibility to all of the options, and allows some sense of which feels right. Sometimes, we don’t even ‘try on’ various scenarios. Useful. Yeah, it’s weird how ‘trying on’ perspectives gives you a really good indication. Excited for your upcoming decision. Totally helpful as I feel in a rut and already have tickets booked to. Barcelona. Thanks. Excellent post again! You have a great way of distilling what you learn into a form others can understand and put to use immediately. Thanks Bob! It was fun getting to learn some of this stuff w you. I like how something considered so “spontaneous” like going with your gut is really based on a well thought out plan. Great post. Yeah, it’s nice to have a method to at least identify that “spontaneous” reaction. This article reminded me of Gavin de Becker’s “The Gift of Fear,” in which he urges readers to listen to their “intuition,” and theorizes that what we call intuition is a place in the brain that is home to many vital observations that our conscious minds have not yet processed. Cool. I am going to check out The Gift of Fear. For sure. You may want to have both you and your spouse do it independently and then compare notes. From there, you all can make a joint decision. I really want to thank you for this post. Like, a million times over. My partner is very good at making rational decisions, but not at making intuitive decisions, which I think could be another way to define “gut decision” as you do here. He’s been working to improve his intuitive decision making skills, but I think this approach could be an awesome way to honor his feelings (which are hard for him to identify sometimes) while giving him a way of tracking his emotional reaction to different possible outcomes. PS: This might be very helpful for people with anxiety disorders like OCD. Glad that it was helpful Laura! I can relate to your partner in that I know what it’s like to be “stuck in my head”. Also, very interesting thought on those w anxiety. I definitely leave this exercise with a much greater feeling of peace and assuredness. Wow very thorough stuff man. Love your writing. Thanks Gary! Good to see you here. This was so helpful for Noelle and I. Thanks for all you put into these posts to make them useful for all your readers! Np! Glad that it helped. Hahaha! Would have loved to have seen that! Totally agree with jumping in. Analogy: it’s a lot easier to steer a moving ship – so get moving and adjust accordingly. Good to see you here! I read this post last week and thought that it was a good way to deal with decisions, but as I was not facing any major decisions continued on to the next post. This week however, I find myself faced with an unexpected major decision and was quick to remember this post! I believe I will be spending time in the immediate future trying on different perspectives. Thank you for planting the seed! Awesome Rachel. So glad that this tool has a practical application to your life! Let me know how trying on these perspectives goes as you make your decision. I’m so glad I stumbled on this article. It is interesting too because I have been trying to figure out how to decide if I should give up on my business (“quit my job”) and move out of state. Nice John. Check in and let me know what you decide! A little late to the party but wanted to say thanks for this article. Really struggling with a major life decision and looking for any resources and this helped. Great article, thanks for sharing it!! Well written.. Glad that I read this. Now I need pen and paper. Knowingly or unknowingly, you now became a part of my major decision making process. Thank you. Awesome piece of wisdom about checking out different viewpoints. I know it works as I am using it already in other areas of consulting. Thanks for sharing, it directly helped me on an issue. Need to make a decision to stay at home in SA or move to UK for a slightly lesser paying job (wife & 4 kids).